I must confess I have a slight obsession with Fall. Being raised in Louisville, KY we actually had a “real” Fall there. Today’s high is in the mid 80’s but that feels cool for south Alabama. So, I’m going for it… fall shoes and pumpkin muffins! Mmm! The muffins taste & smell even better than they look… especially smothered in cream cheese. And the shoes feel even better than they look. I’m a flip flop/Chaco girl and these provide some much needed support after a long summer of no support! My friend Tami is having a c-section this morning! In fact, sweet Mary Grace may already be here! I know she’d love it if you’d send up a prayer for them! Oh I can smell the muffins here in N.C. We do celebrate 4 seasons and fall is arriving quickly….60 degrees last night after a very hot summer. Love the shoes and the muffins look tasty – would you like to share the recipe???? I love fall too – I’ve actually been getting up at 4:30 am to run a few days a week – knowing it’s cool and brisk outside is my motivation!!! funny, I’ve been getting into the fall mood here too… and expressed that by baking! Your muffins look better than mine! Since Saturday, I’ve made two loaves of banana bread, and I’m planning to make a pumpkin roll, which has a sweetened cream cheese filling! YUM! I love Fall, too, Darby! More since I’ve gotten married to Russell…b/c he LOVES this season! Happy Fall to you, too, friend! Cute shoes. I too am a chaco/flipflop/dansko girl. Do pass on the details of those shoes. I think I might like a pair in black and brown. Happy fall from near Louisville KY!! i, too, am obsessed with fall! 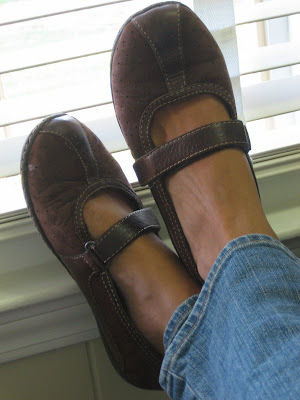 love the shoes–i am excited about wearing my boots again! 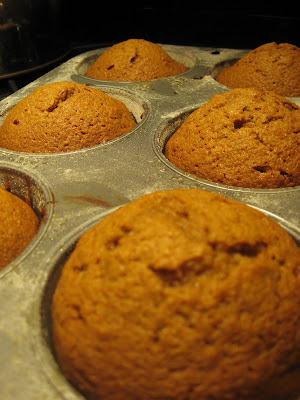 the pumpkin muffins look very yummy–if you have time will you share your recipe? muffins are a staple around here–i can pack lots of good and good for you things in them, and dylan will eat it! we wake up to low 60’s–i think fall is really here!! It’s cooler here too and I’m planning to make Paula Deen’s Pumpkin Gooey butter cake soon! I can’t tell you how yummy!! But I already made banana bread and this pregnant girl is getting to be a fatty so I better watch it! darby- I love the fall and pumpkin muffins too! I just made my first (of hopefully many more) batch the other day. (I just used the pumpkin quick bread mix already in the box and made them according to the muffin recipe on the back)And my little girl ate 2 for breakfast!! Yummy! I have a recipe for WONDERFUL pumpkin spice cookies with cream cheese frosting. I’ll send it to you for sure! Count me in as a fall-aholic. I absolutely love love love this time of year. Here in Ohio fall is gorgeous — I’m ready! I love pumpkin muffins/bread! I make it often in the fall too. Hey, why don’t you post recipe for pumpkin log, pretty please??! Yummy!! I’m not quite ready for closed toed shoes though!!! Hope your friend is ok! I LOVE fall. I actually fill my house with fall scented air fresheners (I love the ones from White Barn Candle Co.)several months before the arrival of fall. I like to “pretend” it’s fall when I’m in the house. I made pumpkin muffins from a mix a couple of weeks ago, but have been wanting to make homemade ones. Are yours homemade? If so, you have to post the recipe. I don’t know if you remember me, but we had some mutual friends while at Auburn. Our husbands used to be friends, as well. (Tell Justin that Ben said “hello”.) 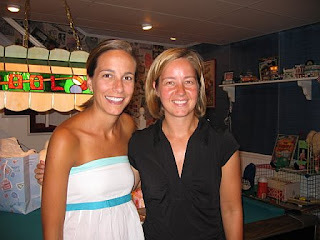 I last talked to you at Chris and Kara’s wedding when we were both pg. Congrats on the little boy! Found your blog from a friend of a friend! Just did some pumpkin bread last night! Working on a low fat/cal recipe… And came across a recipe with a cream cheese layer already in it!